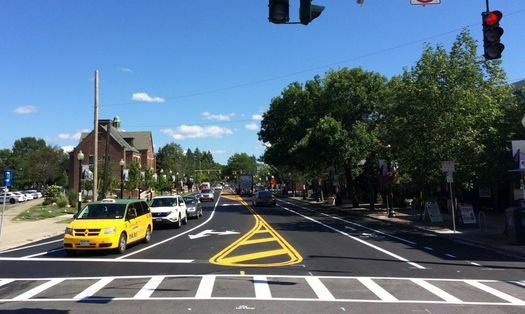 The story of the Madison Ave Road Diet is now almost as long as the road itself. The roots of the project stretch back about 10 years, and public planning for the project started more than two years ago. 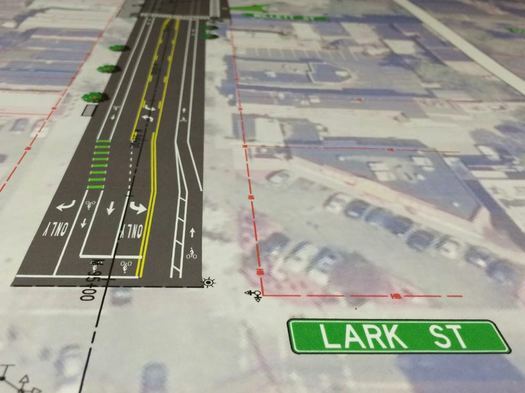 In short: The project is a reconfiguration of the stretch of Madison Ave from Allen Street to Lark Street with the goal of "calming" traffic and making the street safer for pedestrians, cyclists, and drivers. 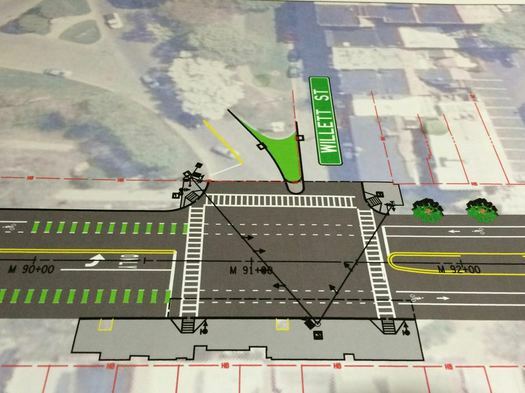 To that end, the reconfiguration plan includes switching the street from two lanes in each direction to one lane in each direction with a middle turn lane, along with bike lanes on both sides of the street. The first segment of the project -- from Allen to Partridge -- was reconfigured last year. The second phase covers Partridge to Lark. The public discussion over the plan has been passionate at times, with cycling advocates pushing for protected bike lanes (didn't happen) and some residents expressing concerns about traffic backups. Phase two of the project will look a lot like phase one. Crews will scrape the street down to its Belgian block paver base and then rebuilt it with new pavement. Then it will be striped in the three lane-with-bike-lanes configuration. The cost of phase two will be roughly $3 million, of which federal and state money will cover most of it. Bill Trudeau, who heads up traffic engineering for the city, said the city will be required to chip in some matching money, but it'd be about 10 percent of that. The public Q&A portion of Thursday's meeting included a handful of speakers who continued to express skepticism that project will be able to deliver on the promise of safer corridor without creating untenable traffic backups. One of those speakers was Melanie McCulley, who lives on Madison Ave near the Willett Street end of Washington Park and works from home. She said that section of the street handles not just high flows of regular vehicle traffic, but also frequent deliveries for the restaurants along that stretch. And she said she's worried that reducing the number of lanes will create blockages and possibly hinder ambulances and fire trucks. "They just don't understand how that area works," she said after the program "I watch it every day, all hours of the day and night. They don't get it." Other people asked about the degree to which the city is monitoring how well the corridor is -- or is not -- working. After the meeting, Bill Trudeau said he thought the first phase of the project has worked out "very well" so far based on observations. The city hasn't done any systematic study, yet. "It'd be very unfair at this point. We want to get the entire road [finished] and then get a good, objective review at that point." Trudeau and the project engineers from Creighton Manning were open about the fact the road diet will mean slower travel times for cars sometimes, and backups in some places. "I think people have to give us the opportunity to put this into effect and have some patience once we put it into effect. Because there's always a growing pain and that growing pain will be for some period of time -- usually a few weeks, maybe a little longer, maybe a little bit less, we're not quite sure. But we certainly think we have the right approach." "We knew that going in, we said that going in. They're not horrible," Trudeau said afterward of the traffic backups. "I think people have to give us the opportunity to put this into effect and have some patience once we put it into effect. Because there's always a growing pain and that growing pain will be for some period of time -- usually a few weeks, maybe a little longer, maybe a little bit less, we're not quite sure. But we certainly think we have the right approach. It's going to take an adjustment. 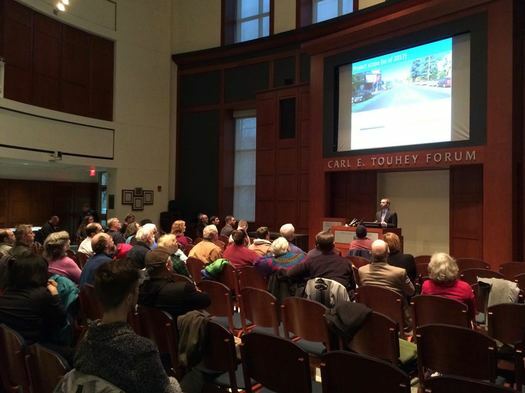 And if we're following that Complete Streets strategy, this it he right thing for this road." After seeing backups following the introduction of the first phase, Trudeau said the city made adjustments to traffic signals that helped smooth things out. And he said he anticipated it would have to make similar adjustments for phase two. Not all the public comments were skeptical. One person praised how "relaxed" the new section of the road feels compared to the part that hasn't been reconfigured, yet. And Lorenz Worden, the president of the Albany Bicycle Coalition, said afterward that the new section feels like "nirvana." "Everybody I know loves it," he said, and added that he hoped the project will serve as a model for other streets. Zooming out a bit, one of the things that struck us while listening to the back-and-forth between skeptical members of the public and the project engineers Thursday was this question: How much do we collectively trust experts? As Trudeau said, the city and the engineers it hired have studied the project "exhaustingly." And they say, based on that study and their expertise, that the road diet will significantly increase the safety of the corridor with a relatively small effect on vehicle users. It is literally their job to solve these sorts of problems. Should we all take those predictions with a grain of salt or two? Sure. Experts get things wrong, too. And the perspectives of people who live in a neighborhood shouldn't be pushed aside just because someone with a consulting contract has come in to assess the situation. We gotta admit, we're not sure where exactly that balance should be struck. But the city making a good-faith effort to monitor the effects of the road diet, publicly report those findings, and work to make adjustments based on what it's learned could go some way to helping earn the trust of skeptical residents. One other thread from Thursday's meeting: No one seems to be happy about the way traffic is working in the zone that stretches from Albany Med to Washington Park and to Lark Street -- not residents, not people who work there, not cycling advocates, not even the city. It is, at least in people's perceptions, a mash of backed-up traffic, people speeding through and out of the park, and cars parked where they shouldn't be. "New Scotland is backed up all the time now," said Melanie McCulley, the Madison Ave resident. "I walk there at least several times a week to go to SEFCU and that area. It's always backed up. It's a problem. Whether that's from [the road diet] or the changes at Albany Med, and there's all that new housing now. We have a problem here. We're too saturated." Bill Trudeau acknowledge that Madison/New Scotland is one of a few ongoing trouble spots. "And we're not so sure how to fix them because it's roadway capacity -- not so much on Madison, but on New Scotland where it's a much narrower road, the buildings are built out to the property line and there's no way to add capacity and that would be the only way to resolve the problem." So, looking to the future, it's worth keeping an eye on whether there's some sort of review or initiative focused on trying work through the issues around that spot. So, if ever you wonder if the people who oversee these sorts of projects are reading comments both here and elsewhere, well, apparently sometimes they do. I look forward to phase 2. I live just below lark and agree with the assessment that phase 1 has given that area a more relaxed feel. I look forward to that relaxed feeling continuing all the way down to where I live. I for one am more then happy to sacrifice some speed and "efficiency" to make the city more livable for the people who actually live there. Madison, Washington and Central are like little drag strips. Forcing the drivers to slow down is a good thing in my view. Something mentioned in the Q&A with the planners after their public presentation, was that at least 20 more parking spaces will be lost on the final phase of Madison Ave and that some other spaces might convert from residential and 90-minute to loading zones, bus stops, etc. These losses might be spread out, but sounded to be planned more for the final blocks of Madison to Lark where there is already a significant parking challenge for both residents and businesses, and related quality of life issues. I bicycle myself and completely understand the need for safe options, but a number of cyclists I've spoken with who try to use the initial bike lanes on Madison express concern that it has not worked as they hoped. Instead, people drive in the bike lanes when traffic backs up, and commercial and other vehicles double park in the bike lanes or the one traffic lane for extended periods. This, coupled with the constant parking activity along that stretch (due to the college and businesses) also means there is no such thing as a bike lane that is consistently usable, while new safety issues were created by eliminating lanes. Concerns are also coming from residents in surrounding neighborhoods who thought they would be unaffected. More than one person expressed concern about traffic issues now being created on side streets as drivers seek alternate routes to avoid slow downs and areas of congestion. Admittedly, a road diet can have positive environmental and safety results, and slowing speeding vehicles is a good thing but, depending on the myriad other factors, there is also a point of diminishing returns when one set of issues is exchanged for another. Time will tell and hopefully it will tell a positive story. Can you please make your website mobile friendly? Thank you! I have really liked Phase 1 of the Madison Road Diet. Albany is awful for riding bikes, so any accommodation for bikes is a welcome change. I have rode bikes with my daughter down the phase 1 and it's great, right up until you get to where phase 2 will start, then you're back in the road, on the sidewalk, or hugging the cars and risking a door prize. I also like the traffic calming, I drive down Madison between 20 and 25mph because there's so much activity from pedestrians, buses, parking, etc. I find in the phase 2 area where there are still two lanes that people will blast past me in the left lane just to get to a red light up ahead and wait. I can often roll right up to the red-to-green change without hitting the breaks. My average velocity is the same as everybody else's without the increased gas and brake usage, and with lower blood-pressure. BTW, I'm a "west of Manning Blvd" person. In Portland, OR there is a street called Clinton Ave that is a local access only for cars, but a through street for bikes. I.e. cars can turn on to the street but only to access the adjacent block, through traffic is not allowed. Bikes can cruise through. Home prices on that street are double those on the adjacent streets. Portland also just built a bridge only for pedestrians, bikes, and mass transit. I wonder what a good candidate street for a conversion like that would be? Washington Ave? New Scotland? And yes, I know what's good for PDX might not work for ALB. Just some thoughts. "....that would be the only way to resolve the problem." said every defeatist and faux-engineer ever. Perhaps a bit more critical and creative thinking would go a long way. They knocked down entire city blocks, but can't make room for more cars.That is insulting to the folks whose homes were demolished to say the least, and an absolutely unacceptable statement from an engineer in any capacity. I want Albany to be bike-friendly. I used to bike to work and would do so again if I thought I could do it safely. But the current implementation has been a total clusterf*ck. I see backed-up traffic constantly and I agree with those who have observed cars in the bike lanes more or less constantly. Car traffic has slowed without much commensurate improvement for cyclists. As to new Scotland and madison: Let Albany Med pay for the fixes. They pay no property tax. Whoever thought central ave is like a drag strip is nuts. Central ave is more like bumper cars, with slow traffic and folks constantly doing nutty stuff. it's the least-predictable street I ever drive on and I mostly avoid it for that reason. I'd like Madison Avenue work to continue from Delaware Ave to Swan. This street is badly in need of attention. Albany Med imports a significant amount of their workforce each day from towns outside of the city. Maybe instead of considering the impact that road changes have on the flow of traffic, we should consider how to impact the number of cars. There are a significant amount of surface lots surrounding the hospitals along Hackett, and Holland. Additionally, shuttles operate all day long bringing employees to and from their cars. If Albany med incentivized carpooling and creating higher occupancy vehicle travel, fewer cars would have to get through these congested areas. Albany Med pays $500k to the city each year, in lieu of taxes. They have grown their physical presence in the city drastically over the past few years, and have not really been accountable for it. These additions have been taxing on the physical infrastructure, and we can see the disrepair that has consumed the lower portions of New Scotland Ave. They charge their employees a fee to park in their lots. Surely these fees can be pooled together to modernize, and improve upon the flow in and out of Albany for their workforce. Albany Med is not the only culprit of this problem either. State government offices, and the many colleges who call Albany home, seem to forget that they do not pay any taxes, but have a significant impact on the physical infrastructure. Everyone has to have some skin in the game, not just the homeowners. Next step: Light Rail on Central from Albany to Schenectady. Roads need to be Pedestrian/Bike first, Public Transit second, Car third. There will be growing pains, but if Albany wants to attract business and Millennials it needs to adjust to future demands. Adding more space for cars only increases the amount of cars on the road - as has been proven for decades. It's backwards thinking, just like widening roads - which only leads to faster more dangerous roads rather than the 'safety' they purport. Mike wrote, "Albany Med pays $500k to the city each year, in lieu of taxes." They have done this exactly twice. It's a good thing but hardly a longstanding arrangement nor is it close to what they ought to pay. I love the section of Madison that has been changed with Phase I and can't wait for Phase II.